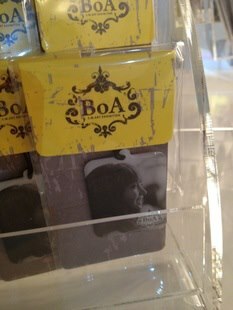 In SMTOWN S.M.ART Exhibition, they sell these BoA PVC cellphone straps, and this new BoA logo caught my eye. I'm just wondering if anyone has a better photo/scan of it? It looks really pretty and reminds me of the ornate The Live 2009 X'mas logo. Edited by trelag, 11 August 2012 - 11:31 PM. Edited by linus22, 12 August 2012 - 07:45 AM. I think that those are only available at the S.M.Art exhibition... the only way you could get it is by having someone buy it for you, then ship it to you. If you ask me, I think they should sell everything that's on sale at the exhibition online when it's over. At least just extra stuff... there's some interesting things there, from what I've seen!